Mystic Korea: Do you also eat vicariously? Do you also eat vicariously? 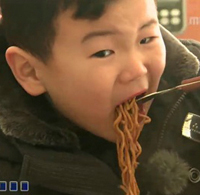 Yoon Hoo, the son of singer Yoon Min-soo, was catapulted to stardom by “eating voraciously” on MBC’s high-rating reality show “Where Are We Going, Dad?” Choo Sa-rang, the daughter of Korean-Japanese combat sports star Choo Sung-hoon, is winning the hearts of viewers mainly for her “eating” scenes on KBS’s variety program “Superman Returns.” Ha Jung-woo is often portrayed as an actor who is good at “meokbang,” a new broadcasting term in Korean, which means “eating well” on screen. Watching someone eat on TV is becoming a bizarre trend in Korea. As “meokbang” gives viewers vicarious pleasure, a growing number of TV shows are competitively obsessed with providing eating scenes. First aired in November, a cable drama series “Let’s Eat” on tvN, the first of its kind, has been gaining popularity. 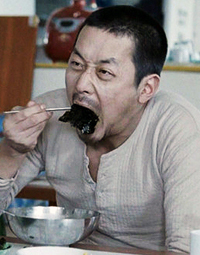 The show features the eating scenes of characters who live alone. Based on romance and everyday routines, the drama portrays the female character played by Lee Soo-kyung relishing eating. In the drama, Lee plays the role of a 33-year-old divorcee who is happy to be living alone. One of her pleasures is food. Goo Dae-young played by Yoon Doo-joon, a member of K-pop group BEAST, is another foodie who lives alone too. Park Joon-hwa, producer of the drama, said that Korean dramas have lots of eating scenes in which conflict erupts or settles down. “The drama focuses on building relationships between strangers through having a meal and ultimately relieving their solitude. It portrays the process of how people improve relations via food,” he said. “The Hungry Woman,” based on the eponymous webtoon, deals with a single woman’s life in her 30s and connects it with food. It has so far had more than 3.2 million views on Naver’s TV cast. Yoon Sung-ho, director of the film, said that the recent trend is adding eating scenes to the ordinary story. “Isolated individuals find consolation by seeing others eating. Meokbang is a symptom of our society’s loneliness,” Yoon said. The recent fad in watching someone eating is attributed to an increasing number of the one-person households in Korea. According to Statistics Korea, one-person households represented 9.1 percent of the total in 1990, 12.9 percent in 1995, 15.7 percent in 2000, 20.2 percent in 2005, and 24.2 percent in 2010. The steep rise is attributed to the increasing number of young singles in their 20s and 30s who leave their parents, as well as those who don’t marry or get divorced along with the elderly who survive their spouses. Cultural critics said that those who live alone feel loneliness and find more vicarious pleasure by seeing someone eating. The trend was provoked by Afreeca TV, the online channel, which aired the live-streaming service of eating enormous amounts of foods by its broadcasting jockey since 2009. CNN reported in February that the show hosted by Park Seo-yeon airs hours-long eating scenes. After eating various kinds of large quantities of food such as pizza or beef, Park talks to her fans in a chat room which accompanies her live-stream channel. “A lot of my viewers are on diet and they say they live vicariously through me, or they are hospital patients who only have access to hospital food so they also watch my broadcasts to see me eat. Fans who are on a diet say that they like eating vicariously through me,” CNN quoted Park as saying. The program’s fans are mostly women and her show is more popular with women than with men. CNN also quoted professor Park Sung-hee of Ewha University’s Division of Media Studies as saying that for Koreans, eating is an extremely social, communal activity, explaining why the Korean word “sikgu” means “those who eat together.” And Koreans hate eating alone. For a long time, cooking and food have been a central element of fiction in Japanese TV dramas. 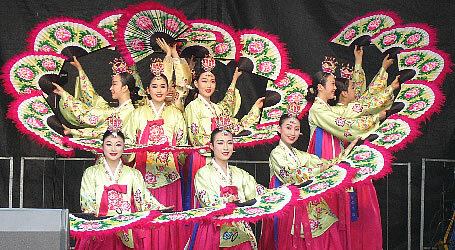 Korean shows seem to follow Japanese social and cultural trends to some degree. In the 2000s, Japan’s NTV aired “Food Fight,” a popular drama series, based on an eating competition, and revolving around love and friendship. Also, “Late Night Diner,” which was first broadcast in 2009, deals with customers who come to a restaurant which opens at midnight. In the drama, people with diverse stories share them with others while eating. Also, “Lonesome Gourmets” began airing its season 3 in 2012, and “Ms Hana’s Cooking” portrays a housewife’s cooking recipe, while “Just Eating” focuses on the eating binges of a man and a woman. However, this is a cultural difference compared with TV shows from Western countries. On Western TV, cooking or food on screen is basically nonfictional, usually seen in teaching how-to-cook to the audience, except for cases in which characters gather to eat in a certain restaurant or bar.